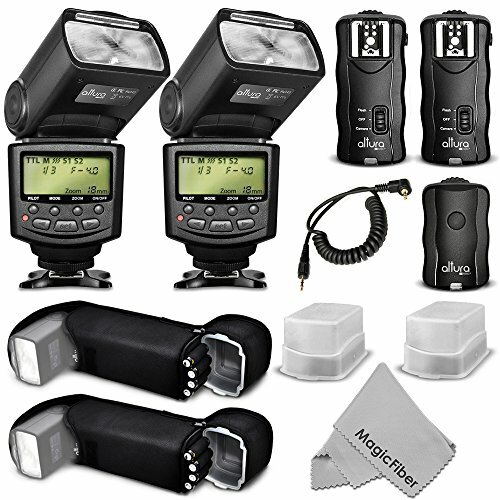 Altura Photo® Professional Speedlite Flash (AP-C1001) is a powerful dedicated flash with a high guide No. 68(m) / 223(ft). Kit includes: 2 Altura Photo E-TTL Auto-Focus Dedicated Flashes + Wireless Camera Flash Trigger and Camera Remote Control Function 1 Transmitter, 2 Receivers + Cable-C Cord for Remote Control + 2 Protective Pouches (Batteries Not Included) + 2 Hard Flash Diffusers + MagicFiber Microfiber Cleaning Cloth. Compatible with CANON EOS 70D, 60D, SL1, Rebel T5i, T4i, T3i, T2i, T1i, T5, T3, XT, XSi, XSi. – Easy to use flash with professional features and outstanding build quality. Dependable and fun to use at a price much lower than rest. – 68(m) Guide Number. Powerful flash performance. – Use as a fully automatic flash or use in manual mode and set custom controls from the on camera menu. – Use in slave mode with a highly sensitive wireless triggering sensor. – Includes a flash stand with tripod mount, separate hard flash diffuser, and high quality protective pouch with battery holder and belt strap loop. – 180° bounce & swivel. – Motorized Zoom Range: 7-step auto/manual zoom 24-28-35-50-70-80-105mm. – Use the wireless flash trigger kit to mount your flash to the receiver and remotely operate your flash from a distance of up to 100 feet. Great for group shots and studio photography to manipulate or eliminate shadows. – Also provides the convenience of a wireless shutter release. Ideal for photographing wildlife and close-up photos. – Due to software incompatibility issues; the Canon T6i/T6s will not fire when in “WiFi Remote” mode. Altura Photo Wireless Flash Triggers will function normally in all other modes.